Wabash College has announced the largest comprehensive fund-raising campaign in its 186-year history. Giant Steps: A Campaign for Wabash College seeks to raise $225 million. At an event at the Indiana State Museum on Nov. 9, Wabash President Gregory Hess announced that Wabash has already raised $150 million in the leadership phase of the campaign, which is more than the College raised in any of its previous campaigns. The campaign will focus on four specific areas: further endowing Wabash’s generous scholarship programs; funding faculty professorships, chairs, and academic programs; providing immersive learning experiences for all Wabash students; and funding capital projects and the Annual Fund. Hess also announced the single largest gift ever given to Wabash. 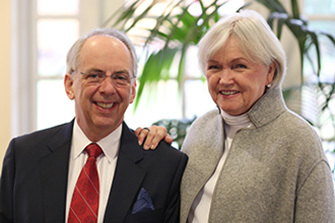 Paul Woolls ’75 and his wife, Betty O’Shaughnessy Woolls, have made a $40 million unrestricted gift to Wabash. The Woollses are serving as co-chairs of the Giant Steps Campaign along with Steve ’68 and Joanie Bowen. More than 30 gifts of more than $1 million were announced at the campaign kickoff. Included are gifts that provide endowed scholarships, faculty chairs, funding for Wabash’s innovative Liberal Arts Plus initiatives, gifts to enhance Wabash’s recreation and athletics facilities, and resources that will permanently endow cross-cultural domestic and international immersion learning experiences.